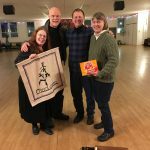 Dunquin Irish trio (sometimes a duo) was born about fifteen years ago to play the traditional music of West Kerry in Ireland; since then, the band has branched out to other Celtic music and even Scandinavian music. The town of Dunquin in County Kerry was a major embarkation point of Irish emigrants to America; hence our name reflects a strong Irish-to-American connection. Dunquin performs at festivals and events in Minnesota and Wisconsin, including the Minnesota Irish Fair and several historic sites. Dunquin presents several concerts every year and is available for weddings, parties and celebrations of all kinds. Dunquin has recorded two studio albums and several live concerts. Its members include Sherry Ladig (piano), Don Ladig (flute and whistles) and Rosa Wells (fiddle). 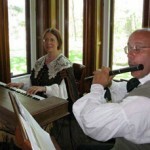 While chiefly a Scottish performance band, Dalwhinnie frequently also plays for English Country dances, Jane Austen-era parties, and has an extensive knowledge of music of British naval history circa 1750-1850. Dalwhinnie is Rosa Wells (fiddle), Don Ladig (flute) and Sherry Ladig (piano and arrangements). Dalwhinnie is available, in or out of period costume, for special events. Elite Rabble plays the music of late Georgian and Regency period, from 1760 to 1820, including English Country Dance tunes, nautical tunes and songs, Boccherini , Geminiani and O’Carolan. Elite Rabble travels as either a duo (Baroque flute and piano/harpsichord) or as a trio (with the addition of the violin). Musicians: Sherry Ladig, keyboardist/arranger/booking agent; Don Ladig, flute; Rosa Wells, violinist. 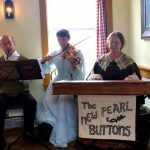 The New Pearl Buttons perform American and European music of the mid to late 19th century (circa 1840-1900). 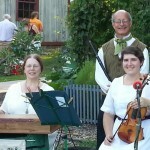 The ensemble includes fiddle, flute and piano (and sometimes mandolin) and often plays historic sites in Wisconsin and Minnesota, including the Historic LeDuc Estate in Hastings, Waldmann’s Brewery and Wurstery, the Minnesota Historical Society and several festivals. The “Buttons” perform with Don Ladig on wooden flute, Rosa Wells on violin,and and Sherry Ladig on piano as a trio, or as a quartet with the addition of John Wenstrom on mandolin and vocals. The group is available in 1860’s costume for all festivals and celebrations.